Some people thought that this painting by Bruegel was one of the European peak works in the 16th century. 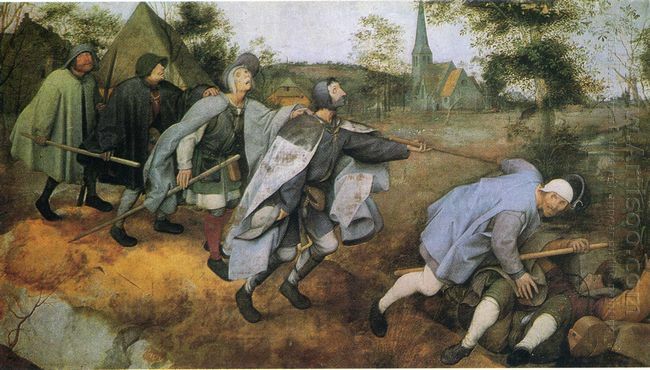 Profound philosophies in the authentic art image were the artistic characteristics of Bruegel. Both the natural scenery and characters he created had the reality of Netherlands’s life, even if was exaggerated, it was never far from the fundamentals of real life. Hunters in the Snow depicted the agricultural simple life scenes to express his love. This painting was one of group paintings which a Belgian collector ordered to Peter. 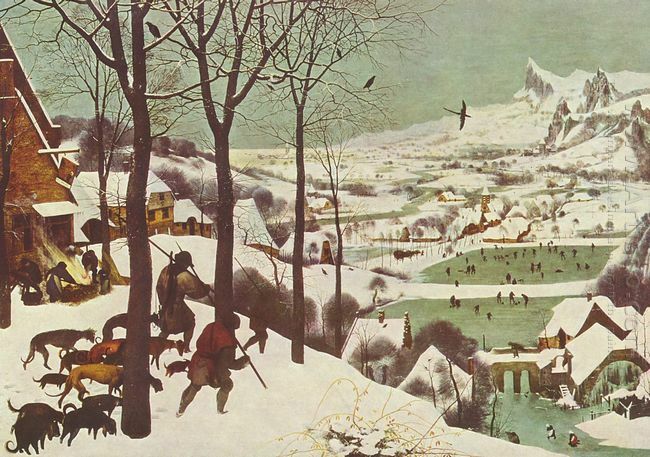 Hunters in the Snow was a masterpiece created by Pieter Bruegel in 1565. This painting is currently preserved in Vienna Museum of fine art. containing the desolate atmosphere that enveloped the life. Bruegel was not a farmer, but all showed his love for the country life. This painting showed the painter pays attention to the countryside style Lyric scenery and quiet simplicity. This was a profound landscape painting with people’s activity. The painter seemed to be looking at the hunter from top of the mountain and make hyperopic panorama through the hunter. The hillside and horizon in diagonal form combination form images which were the most changeable slope to the trough. The proper distance perspective treatment made the screen with a profound sense of space and air. The painting had very skillful process. The thick trees of similar silhouette stood in the foreground and white snow covered the sleeping earth, solemn and quiet. And the hunter across the forest and the clever dog, distant ice skaters on figure and flying birds in the air endowed the quiet mountains with full of vitality. The Lacemaker was also translated The Lacing Girl, or Lace Worker. 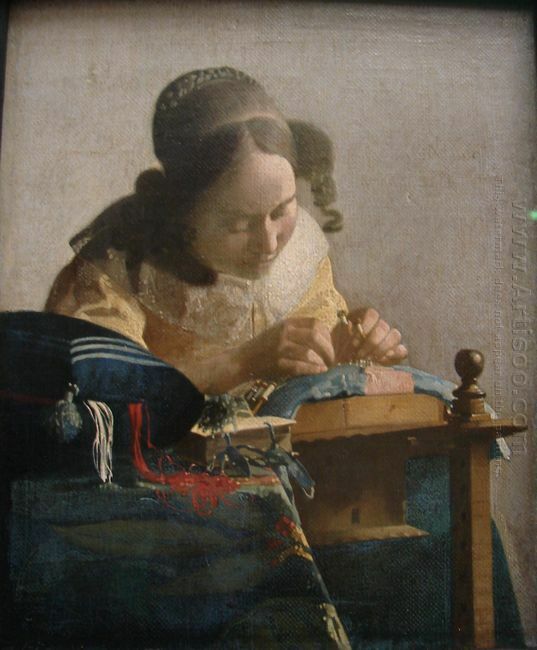 The Lacemaker was Johannes Vermeer’s outstanding work and also one of his representative works. 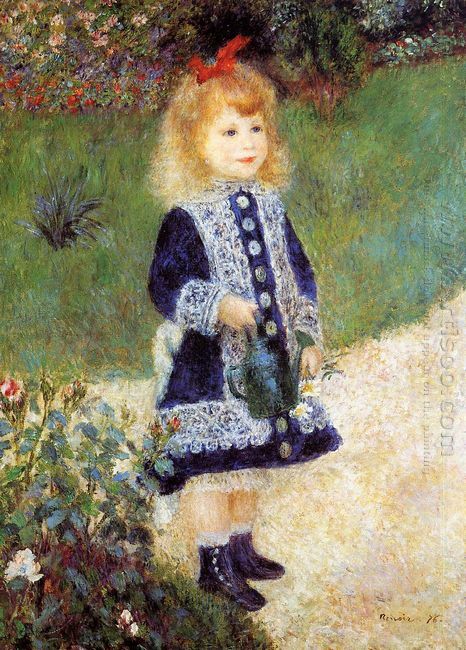 The painting described the concentrated and peaceful eye look of a lace worker in the poetic style, with a lyrical mood to give people the enjoyment of the beauty. The difference between Vermeer and contemporary painters was that he used the extreme, and even trembling sensitivity to express the light and like using two kinds of colors such as blue and yellow to form very harmonious color tone. The special light in his works was actually made by a new technique. This technique relied in the optical experiment, but mainly relied on the observation, and delicate osmotic reflection of sense of color. He specially captured the bright color with small pearly highlights constituting the object contour. The focal length in the painting was distributed, therefore it appeared to be calm and objective. The Lacemaker showed that the serious girl was the most beautiful. If looking carefully, you will follow the light to see the girl’s fingers constantly acting as a go-between with line, and you’ll notice her hair on the both sides up and loose. It will be very natural that you will dance with this painting which was an eternal one turning the instant moment into forever scene. The girl dressed in yellow and the blue cushion gave people warm on the one hand, and making people enjoy the simple beauty of daily life on the other. Girl with A Pearl Earring (Dutch: Het meisje met de Parel) was made by Holland painter Johannes Vermeer in the 17th century. The painting took the pearl earrings worn by the girl as the focus which was preserved in the Mauritshuis in Hague. This was a small painting, not much larger than eight-paper. The paints had been cracked, but such a seemingly small painting appealed a lot of men of literature and writing and visitors. What shocked their hearts? It was the protagonist – a girl with a pearl earring. The girl’s glimpse seemed to intake the viewer’s soul. Vermeer used the entire black background in this painting, and made a strong three-dimensional effect. The black background showed the charm of girl’s image, making her like a beacon in the dark, its brightness dazzling the eyes. The girl leaned in the body and turned to stare at us with her mouth slightly open as if saying anything. Her eyes showed strong feelings, whose head slightly leaned to the left as if lost in thoughts. The girl wore a chastity brown coat, forming a distinct color contrast with white collar, blue headscarves and lowered lemon color cloth. Johannes Vermeer used ordinary, pure color and limited color range in the painting, then used levels and shadow effect. Another remarkable place of this painting was the teardrop-size and vague pearl earrings worn by the girl, which was the punch line of the whole painting. 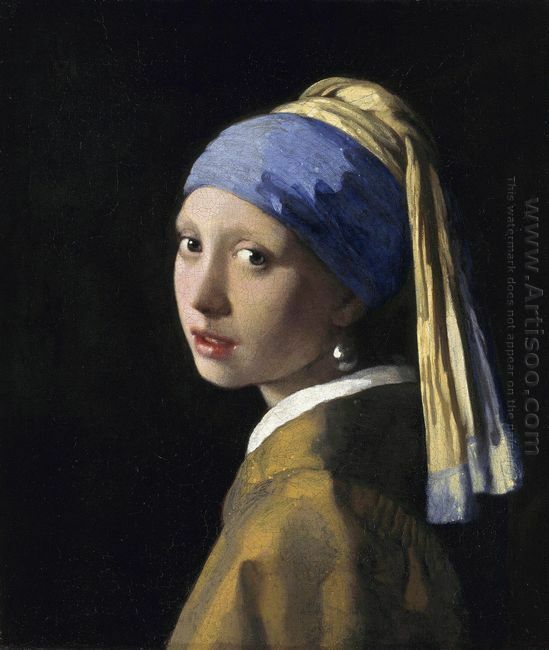 Pearl in Vermeer’s paintings usually was a symbol of purity. Critics thought that this painting was likely to be made before the girl’s marriage eve. The girl’s temperament was extraordinary and she stared at the painter with no distraction. Seeing this painting, the viewer can be easily melted in the affectionate gaze. Holland art critic Gore Skei Jerzy de thought this was Vermeer’s finest works, which was the “northern Mona Lisa”. The charm of The Smile of Mona Lisa lied in her secret. No one knew exactly why this woman could emanate such a quiet smile, and artists were in what mood to draw such works. Since the production of this painting, the world people marveled at the girl in the painting: brightness changes of soft clothing lines and earrings, especially girl’s side back, wanting to speak, but saying nothing, only the smile of Mona Lisa could be comparable. The girl’s true identity as well as Mona Lisa was a historic relic mystery. The Girl with A Pearl Earring was known as the northern Mona Lisa. the painting, under the opened curtain, the Virgin holding a baby Jesus slowly flew from clouds to land. Her feet, kneeling old Pope Sixtus and young beautiful Saint Varvara. In front of them were two lovely angels. The Virgin has a beautiful and quiet face, although she knew she have to sacrifice her son to save mankind. Baby Jesus nestled in his mother’s arms, his eyes were open and seemed looking at us. He seems knew everything. 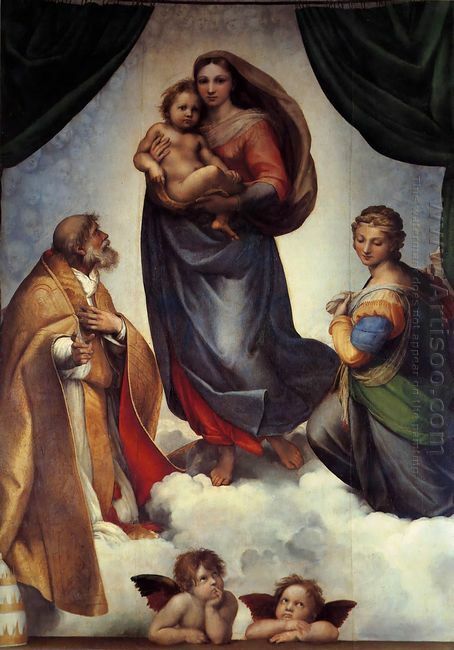 Upon the commission of Pope Julius II in 1512 to honor Pope Sixtus, Raphael finished the painting around 1513 to 1514. After finished, the painting was kept in the church San Sisto in Piacenza as an altarpiece. It was removed to Dresden until 1754 when sold to Augustus III of Poland for 110,000 – 120,000 francs. During the Second World War, the oil painting was stored with other works of art in a tunnel in Saxon Switzerland, and then took by the Red Army. In 1955, the Soviets decided to return the painting with other treasures to Germany for the purpose of strengthening and furthering the progress of friendship between Soviet and German people. After its return to Germany, the painting was restored to display in the Gemaldegalerie Alte Meister of Dresden. Sistine Madonna is the most famous and the top madonna paintings, highly praised by people around the world from the day it came out. Raphael was a great Italian painter and architect of the Renaissance. His work was known for clarity form and elegant figures. Together with Michelangelo and Leonardo da Vinci, Raphael is admired as the traditional trinity of great masters of Renaissance..
Raphael’s full name was Raffaello Sanzio da Urbino, he was born on April 6 or March 28, 1483 in urbino of Italy. His father was an artist and poet, who led him into the world of art. Raphael’s talent on art was recognized early in childhood. In 1504, the young Raphael went to Florence to study the works of Michelangelo, Leonardo da Vinci and Fra Bartolomeo. In 1508, 25 years old Raphael was commissioned by Pope Julius II to produce a series of frescoes for four state rooms of the Vatican Palace. Later in 1514, Pope Leo X appointed Raphael chief architect of Saint Peter’s Basilica. Raphael’s fame grew very fast in Rome. He was considered to be the most important painter and architect in Rome by that time. Raphael never married, but engaged to Maria Bibbiena instead of his love La Fomarina Margherita Luti. Before getting married, Raphael died of a fever on April 6, 1520 at the age of 37. According to his will, Raphael was buried in the Pantheon. Despite his death at 37, Raphael was enormously productive artist. A large quantity of his works remain tody. Many of them are found in the Apostolic Palace of The Vatican, where the frescoed Raphael Rooms were the central, and the largest work of his career. clutching the water pot firmly. Those words proved the fatal attractions of Picasso to women in his whole life. Women were Picasso’s goddess, but to the seven women in his life, Picasso was the incarnation of angel and devil. Olga and Dora were mental breakdown due to him, Mary and Jacqueline chose suicide. The style of Picasso was changeable and was called “chameleon”, just as his mutable history of love. The 23 years old Picasso was still a poor artist lived in Montmartre who was known as the “laundry boat”. Once the girl next to him – Olivier went downstairs to the faucet to take in water, Picasso fell in love with her at first sight. They lived a life of drinking and drugging together, and at the same time Picasso said goodbye to his “blue period” and turned into the gentle “pink period”. Eva was the lover of a friend. Picasso called her “Eva” affectionately which indicated that she was the first woman he really loved. Picasso said:” I love her, I want to write her name in my paintings.” And Picasso really wrote “I love Eva” on a painting. But strange to say, Picasso always depicted his women on the canvas but leaved out Eva alone. And Eva died because of tuberculosis a few years later. When Picasso designed scenery for the Russian Ballet in Rome, he fell in love with the ballet dancer Olga, and they married officially in the next year. Olga loved the upper class life so Picasso changed his style too. He followed into the salon circle and turned on the style of “neo-classical period”. Later, Picasso began to go on the spree, Olga became mad and this romance ended in divorce. The prestigious Picasso saw her coming out from the subway station. He could not help but catch her hand and said:” Miss, you look so beautiful, and I want to draw a picture for you, I’m Picasso. ” She was only 17 then but Picasso was 46. The time together with Mary was the most profligate and joyful time of his life. Picasso separated the body and reorganized again and formed the unique creative style “the deformation period”. At the 50th anniversary of their meet, 4 years after the death of Picasso, Mary hanged herself in the garage at the age of 68. They got to know each other in a café. Dora was a photograph, painter and model with strong personalities. They were bosom soul mates. When Picasso threw her over for someone new, she was hospitalized due to depression. When Picasso and Dora were eating in a restaurant, he noticed the two beautiful girls in the nearby table. He could not help but go over and introduce himself to them, and found that the student who liked the beauty in ancient Greek was called Franceva. Ten years later, Franceva went back to Paris with their two children and remarried later and then migrated to the United States. She was the first and the only one woman who had the courage to leave Picasso initiatively. Picasso met her in a ceramic shop. She was a clerk there who was a young divorced woman with a years old daughter. She took care of all the affairs of Picasso and dedicated herself to him in order that he would just let her stay at his side. 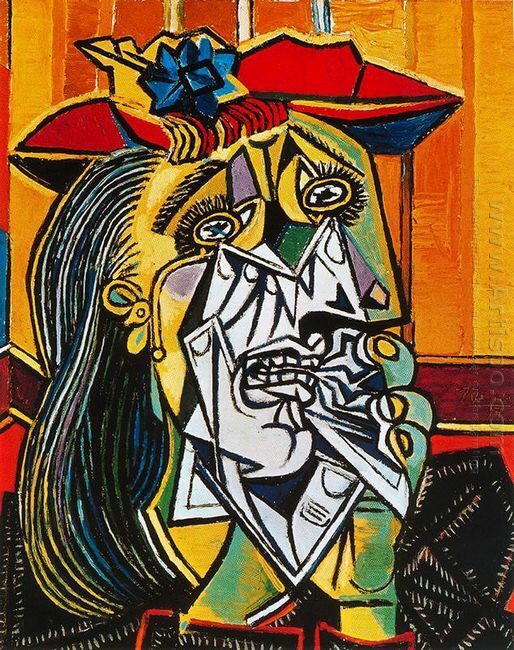 After 13 years of Picasso’s death, Jacqueline who was indulged in sadness and could not extricate herself out fired a shot on her temple and committed suicide. Just as Picasso’s prophecy:” It would like a shipwreck when I die. A colossal ship sinks, then many people around it will sink too.” Early in Picasso’s funeral, his grandson was not allowed to take part in the funeral of his grandfather and drank bleach and died. His son committed suicide later. Vase with twelve sunflowers is painted by the legendary Dutch artist Vincent Van Gogh. 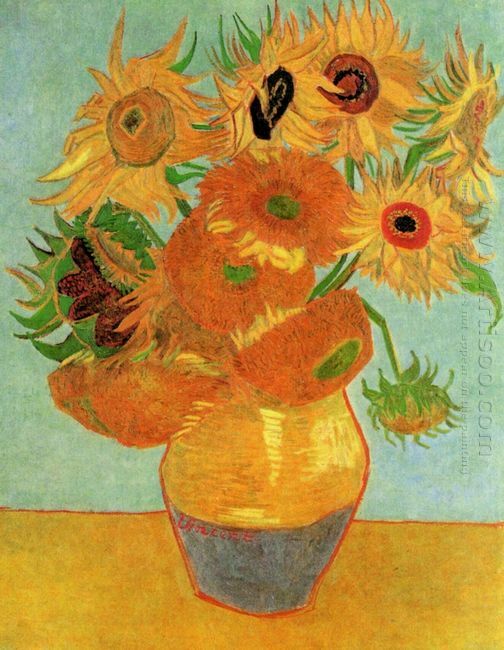 Van Gogh has painted two series of still life paintings featuring sunflowers. The earlier series executed in Paris in 1887 depicts two sunflowers lying on the ground, which are exchanged with Paul Gauguin for his studio after he left Paris. The second set executed a year later in Arles shows bouquets of sunflowers in a vase. According to the announcement of Van Gogh, he has painted four different versions of the Arles sunflowers. They differ either in size, the color of the background or the number of the sunflowers, particularly, two more sunflowers lying in the foreground, center and right in the second version. The Vase with twelve sunflowers is the third version and the last version inserting three more sunflowers into the vase. Van Gogh uses pale yellow, dark yellow, golden and brown to depict sunflowers sitting in different stage of life, from full bloom to withering. Some droop down as if petals hardly fall down on the table when you touch them while some other stands upward. In his early ages, Van Gogh uses no more than dark down to paint, which reflect his tragic real life. At that time, bright color are favored by the viewers, while gloomy color make it difficult to sell his paintings difficult. After get acquaintance with impressionists in Paris, Van Gogh begins to convert his color to carmine and gradually extend to more colors. This painting is celebrated for its innovative use of the yellow spectrum, partly because newly invented pigments made new colors possible. It looks like an embroidery and full of texture. The longer you look at them, the much richness it takes on. Van Gogh gives the viewers his feeling and perspective of objects rather than reproducing the object. After his pallet become brightened, he become enchanted with unmixed and glorious colors and use color more casually to demonstrate the misery but realist relationship among the world. Fishermen at Sea is the first exhibited oil painting by Joseph Mallord William Turner. He is born to be a painter, he entered Royal Academy of Art schools at age of 14 and his watercolor painting was first exhibited one year later. Comparing with many artists, he is lucky because he is reputed in his earlier age, which makes him become financially free and be able to paint as he like. Being recognized by his oil painting, he is also good at watercolor landscape painting. Besides, he used to be fascinated with architecture and practice a lot on pencil sketch and do many exercise in perspective, which pave a way for him to form his peculiar painting style. 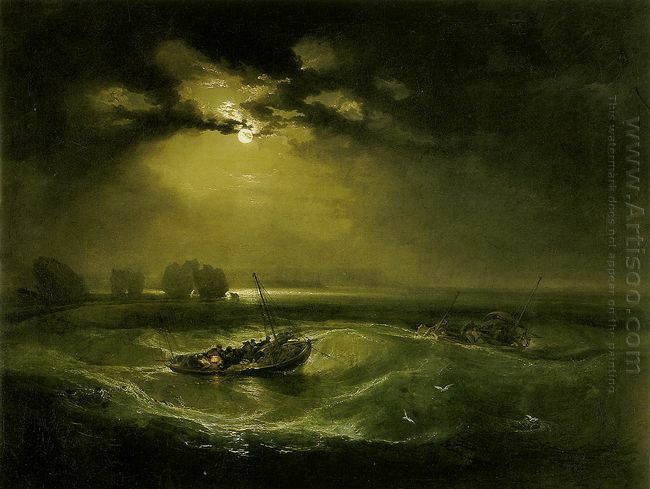 Fishermen at Sea is a marine painting depicting a nocturnal moonlit marine scene where a boat is in peril. This genre of painting is particularly strong from the 17th to 19th centuries. Turner is obsessed with marine art for his life and produces many famous marine paintings, such as The Slave Ship and Down after the Wreck. Dark penetrate every corner of the world, trees in the distance were dyed black. We can hardly distinguish the outline of the estuary as it has already integrated into the darkness. Seabirds were pressed to fly close to the sea surface. Although it seems tranquil now, all of these foreshadow the forthcoming of a storm. Two boats float on the sea, they seems hardly sink when a stronger gale blow. Struggling against the gale, fishermen attempt at taking control of the boat and are prepared to face a storm. The large-area use of black make viewers held their breath out of terror. However, the bright moon show up in the center among the dark clouds, casting bright and clear glow down upon the boat, which echoes the lantern held by fisherman, adding radiance and beauty to each other. In between the moon and the boat, the cone-shaped bright area, just like someone tears a split of the darkness, bringing the viewers hope and relief.